The central character of Han Kang’s The Vegetarian, Yeong-hye, is reminiscent of Kafka’s A Hunger Artist. At the beginning of the novel she’s distinguished only by her ordinariness and passivity, but it’s the assertion of self-deprivation from meat that becomes a revelation. Meat literally disgusts Kang’s character, but as she withers away, losing weight and her mind in the face of the disapprobation of her husband and father (who actually attacks her), she, like Kafka's character, exudes the power of the anorexic personality. So there are two sometimes conflicting issues at the center of this acclaimed novel and ones that are at times in conflict with each other. 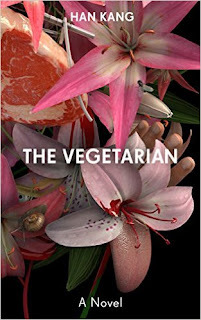 To choose a vegetarian lifestyle is obviously not tantamount to starvation, but the brilliance of the novel is the way it actually defies pathology, camouflaging an inner drive with a social act. However, what The Vegetarian also has in common with the Kafka masterpiece is the aestheticizing of Yeong-hye’s condition. Art is Yeong-hye's salvation, even though she's simply the subject of an artist's work. It's her brother in law, a video artist, who colludes in Yeong-hye’s resurrection, though he himself is barely conscious of his own motives when he first starts to paint her body.You might think that a novel with a title like The Vegetarian has an axe to grind. However, it’s just the opposite. The postures of the characters actually become more inscrutable as the author weaves the literary equivalent of a musical theme and variations on the calling described by her title.